MOSSEL BAY NEWS & VIDEO - Officially, 4 430 bikers from across South Africa and neighbouring countries registered to participate in the 2019 Buffalo Rally. 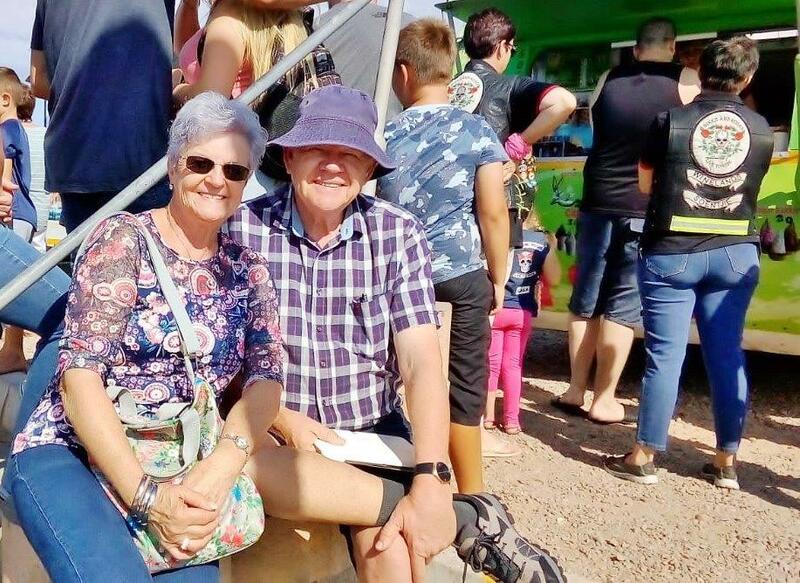 None, however, was more fortunate than Bernard Claassen, a local biker who walked off with the huge R135 000 cash draw prize at the conclusion of the 14th event in Mossel Bay on Saturday night. Claassen was outside the jam-packed festival tent when the lucky draw for the lucrative cash prizes was done. Even his friends thought he was joking when he exclaimed that the announcer had just called his ticket number. Eventually, he had to scramble under the flaps of the big tent to make it in the nick of time to the stage to claim his prize. "I am ecstatic; the money is very welcome. I have lots of plans of what to do with it," Bernard told the Mossel Bay Advertiser. Chairman of the Nomads Motorcycle Club, the organiser of the annual Buffalo Rally, Luderick Jacoby said the club was extremely happy with the turnout. "Hosting the event in Hartenbos was a steep learning curve, but if Hartenbos will have us back, we hope to return to Mossel Bay next year." The municipal manager, Adv Thys Giliomee - pillion passenger on Glen Kotzé's bike - accompanied the Nomads as they led the bikers on the mass ride through town. 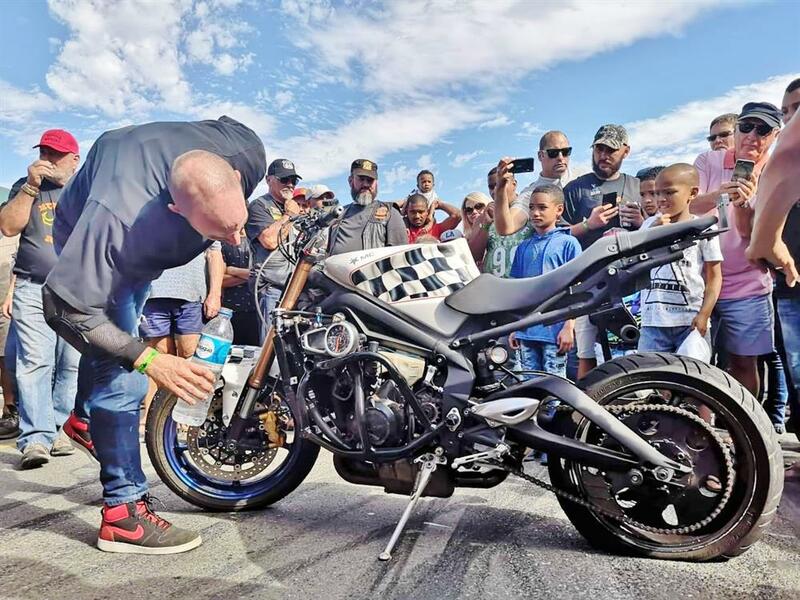 Scores of locals lined the sidewalks as the thousands of bikers on bikes of all shapes and sizes made their way around the Point and - for the first time - past Luthuli, through D'Almeida and Tarka, and on their way back to the ATKV Hartenbos festival arena. Advocate Giliomee said he was impressed with the better than expected turnout and congratulated the Nomads on a well-organised event. "We hope to see them back in Mossel Bay for many more years; the town can hardly ask for a better return on investment than what the rally delivers." He said he personally had not received any complaints about the rally at the time of going to press. Businesses in Hartenbos especially, but also in the rest of town went out of their way to welcome the Buffers whose visit was a welcome financial boost to the local economy. Many Buffers said they were planning to prolong their stay until after the long weekend. Quite a number of participants, for this reason, did not camp at the Buff camping site but stayed in nearby accommodation. In the campsite, however, many younger riders and quite a number of locals enjoyed the camping experience and ambiance. The new venue posed a number of challenges to the organisers but also allowed them to group the stalls according to their various categories, an arrangement that was welcomed by many a stall holder, all of whom reported excellent sales. The Nomads also had to employ approximately 40 locals, many of whom were used for security, also on the outside perimeter of the festival arena. The popular Miss Buff contest was won by the Finnish beauty, Sara Kauranen, who is visiting with her South African boyfriend. The first princess was Abigail Andreas. Shanley van der Merwe was crowned the second princess. Was the decision to move the Buffalo Rally to Hartenbos the right one? Judging by the feedback from participants, business owners and locals the Advertiser spoke to, the answer is a resounding "Yes!" The oldest Buffer, Peter Crawly, also won the double whammy prize of having the oldest motorcycle at the rally. Bike and rider have a combined age of 124 years. 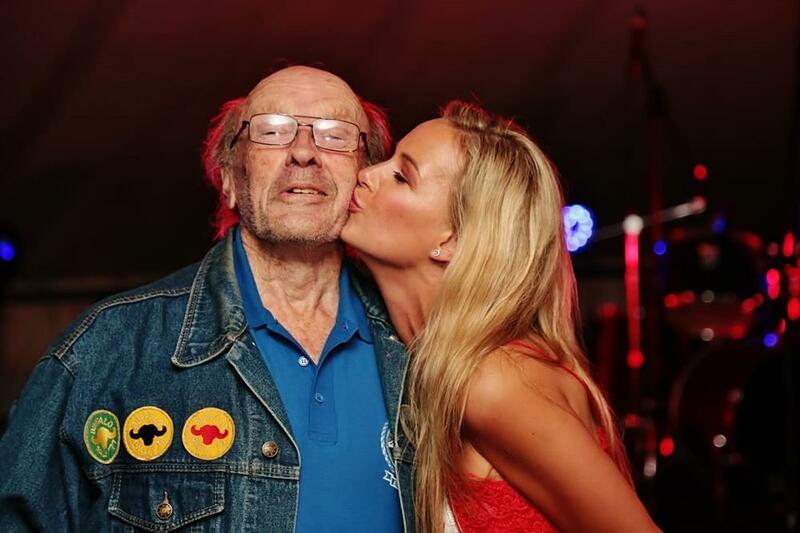 Here he receives congratulatory peck on the cheek from Miss Buff 2019, Finnish beauty Sara Kauranen.